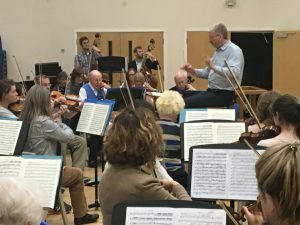 Under the baton of musical director, Jim Cooke, the OMS orchestra performs a broad range of music from the great symphonies and concertos to the work of contemporary British composers, film music and light orchestral selections. We give four concerts each year, three jointly with the choir and one exclusively orchestral concert. If you love playing the great classical symphonies, and concertos, you’ll love OMS. 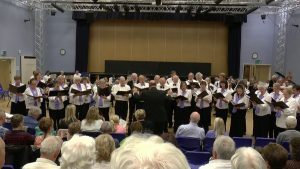 We also perform interesting pieces from the light music repertoire, from living composers, of course have the pleasure of accompanying our talented choir during many of our concerts. As a member you will have the opportunity to contribute ideas for new repertoire also. 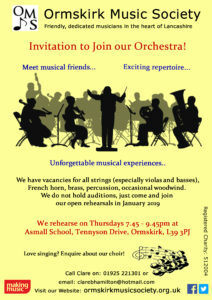 There are vacancies for all strings, (especially violas and double basses! ), and for some woodwind, brass and percussion instruments. Come along and try us out! 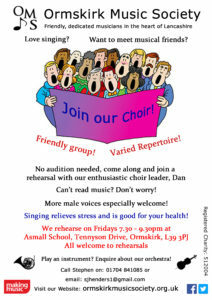 We rehearse on Thursdays from 7.45 pm to 9.45 pm at Asmall Primary School, Tennyson Drive, Ormskirk, L39 3JP. 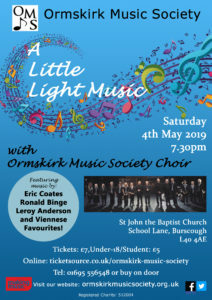 Copyright © 2019 Ormskirk Music Society – Powered by Customify.